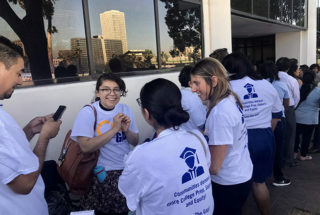 Parents and students line up outside the LAUSD boardroom in June. LA Unified’s seven school board members — or six for now — make vital decisions impacting more than 570,000 students. Parents, community members, and the general public want their concerns to be heard, but what’s the best way to connect with the board members? Besides email and phone, there are board meetings most Tuesdays with designated times for people to address the board members. But the process has long been fraught with frustration, as it was at last month’s meeting when some parents and education advocates lined up overnight to make sure they could get one of the limited numbers of speaking slots. The school board meets most Tuesdays to discuss, approve, or reject matters on behalf of the constituents who voted for them to represent their interests at the school board table. The public has the right to speak but must follow the meeting rules (listed below), such as signing up before the meeting starts, providing personal information, and indicating the topic on the agenda they wish to address. Speakers are taken on a first-come, first-served basis, but there are only a certain number of public comment slots, and some people, like elected officials, are granted priority, or a “courtesy,” to get one of those slots. That happened last month when a former board member, Jackie Goldberg, was being considered for a temporary board seat, and she and a supporter were given time to speak even though the speaker slots had been allotted to the parents who had waited for hours. Crain acknowledged that the Goldberg supporter should not have been granted speaking time. “They mistakenly signed up the woman who was accompanying Ms. Goldberg; she should have been signed up at the same time as the general public,” Crain said last month through a district spokeswoman. Arlene Irlando, chief of staff for board member Scott Schemerelson, said, “Any board member can ask that an elected official or former elected official be allowed to speak without having to wait in line. It’s too bad that if people who may have shown up very early in the morning did not know that the number of speakers would be expanded, but that wasn’t anything that happened until that very morning. “Honestly, nobody should line up at four in the morning to speak to the board of education about their concerns that affect their children, that’s outrageous! We definitely need a different method. There’s a lot of finger-pointing going on, and I don’t know we could have done any differently,” she said referring to the Aug. 21 board meeting. The next regular board meeting is this Tuesday, and board members have made it clear to LA families that their input matters and that there also are other ways to reach them. “Email is the best way to reach Ms. García. She personally responds or someone in the team will handle or try to resolve any problem our constituents or parents face, or we can direct them to the appropriate department or offices (in the district),” said a spokesperson from García’s office. By phone: Beaudry office is 213-241-8333. District office is 818-654-3785. “Board District 3’s office is doing everything possible to make sure people can be heard. Mr. Schmerelson thinks this is important!” Irlando said. By email: Nick.melvoin@lausd.net to reach the board member directly; bd4info@lausd.net to reach the office about quick constituent concerns. “To get in touch with my office, you can call, email, visit our website, send a Facebook or Twitter message — we are available and here to help! We respond to every constituent concern that we receive — whether it’s a problem we can help solve, or just need to get a constituent to the right person at LAUSD to provide the assistance they need,” Melvoin said by email. If you live in southeast and northeast Los Angeles or within the boundaries of this map, your board representative seat is currently vacant until one is elected next year. The primary special election will be held March 5. “I am always happy to hear directly from families and constituents in Board District 6. Calling my office or emailing is the best way to get in touch, although I recommend including a member of my staff on email for the fastest response. If there is an issue at a particular school, we’ll work closely with the Local Districts to try to resolve the concern. We also frequently hear about Board or District policies, and that feedback helps us ensure we’re serving our families and our schools well,” Gonez said in an email. Cara Onofre is director of community engagement and advocacy for Arleta, Lake Balboa, Mission Hills, North Hills, North Hollywood, Panorama City, Reseda, and Van Nuys. Esmeralda Marcial is deputy director of community engagement for Lake View Terrace, Pacoima, San Fernando, Shadow Hills, Sunland-Tujunga, Sun Valley, and Sylmar. Any person as an individual, or as a representative of a group, shall be granted permission to address the Board of Education by oral presentation at a regular meeting. A request to address the Board shall be made prior to the item being before the Board for action on a first come first served basis. The number of speakers on any one topic or agenda item shall be limited to seven (7) unless otherwise directed by the Board. And there is a three-minute time limit per comment. The Board President, with the concurrence of the Board, may call a special meeting for the sole purpose of hearing speakers. At any hearing, there shall be a limit of 40 speakers (unless otherwise directed by the Board in the public notice). In order to accommodate the schedules of teachers, staff, students, families and community members, for Board Meetings beginning at 1:00 p.m., public comment shall begin at 4:00 p.m.
All board meetings take place at the school board room located at 333 S. Beaudry Ave., Los Angeles, CA, 90017. The upcoming regular board meetings this month will take place at 1 p.m. on the Tuesdays of Sept. 11 and Sept. 25. The board meetings’ calendar for the entire school year can be found here. Since last school year, a “Kids First” help desk table has been available on board meeting days outside the entrance of the boardroom. It is set up before the meeting and is staffed until the end of the meeting. Staff members from the Office of Parent and Community Services are available to provide personalized help with questions, to hear complaints and requests, and to connect families with the right district personnel.